The role of alternative protein has generally fallen to soy. After all, it is one of the few complete plant proteins. Wheat gluten once was just as popular as a meat substitute, however, wheat gluten has built-in disadvantages given today's climate of gluten-free popularity (even among persons who are not necessarily sensitive to gluten). One of the latest and most promising alternatives to soy is a resurrected staple of Roman soldiers, the lupin (Lupinus) bean, or simply "lupino." This member of the legume family is one of about 280 species that grow throughout south and western North America, New Zealand, Australia, the Andes, the Mediterranean and Africa. The large, golden yellow, high-protein beans (36 percent protein on a weight basis, which means 36g protein, per 100 g of bean) are commonly cooked and preserved in a briny solution. Older varieties require special preparations to remove bitter alkaloids that can cause allergic or even toxic reactions. However because of the interest in lupin beans as a staple food, newer, sweet cultivars have been developed that contain only trace amounts of alkaloids (although they still require processing to remove remaining traces). These "sweet" lupin beans are ground to flour, which is used to create protein-rich breads, or used like soy to create a variety of vegetarian or non-dairy products, including milk substitutes, lupin tofu and lupin hummus, according to Lopino Foods Inc., Mt. Shasta, Calif. In addition to the rich protein profile that includes the full range of amino acids and nearly equals soy in total protein content, the lupin beans are lower in fat than soybeans and grow well in a wider range of climates. They are lower in fat and richer in soluble fiber than soy. For some, these characteristics make lupin beans an important resource for formulation by creating products that can have an impact on the modern epidemic of obesity and its many complications, including type 2 diabetes. Some of the benefits of lupin flour include: enhanced blood sugar control, improved cholesterol/blood lipid profiles, reduction in blood pressure and improved gastrointestinal health, no doubt due to the high presence of soluble fiber. Of course, as a member of the legume family, the lupin bean is a naturally gluten-free food. This makes it attractive to those few who suffer from celiac disease and those who simply want gluten-free choices. The characteristics of the lupin bean allow for the formulation of a wide variety of products. For example, the high-protein, low-fat content and water-binding ability of soluble fiber can be used to create reduced-fat sausage patties by replacing meat fat with soluble fiber derived from the lupin bean. This combination has been shown to enhance satiety, reducing the tendency of subjects to overeat throughout the day. Breads can be enriched with whole lupin flour, replacing some of the wheat. This is reported to reduce energy intake throughout the day and enhance the feeling of fullness. Substituting lupin flour for common white flour can reduce the tendency of the bread to raise blood sugar. White flour breads are used as the standard by which satiety index is determined. Enhancing the feeling of fullness over white bread in the satiety index is considered a positive move for those seeking healthy weight alternatives. The lupin bean, like other legumes, is rich in soluble fiber, which has the potential to lower total cholesterol without affecting HDL cholesterol. That is because the fiber binds bile acids that are secreted during the digestion of fats. Bile acts as an emulsifier of fats. When trapped by soluble fiber from foods, bile is removed and fails to recycle. Since bile is made of cholesterol, the liver must replace the loss by drawing cholesterol in the form of LDL from blood. Reformulating products with lupin flour can have many advantages due to the high-protein, low-fat, high-soluble fiber content. 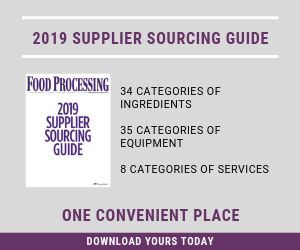 The water binding ability and low energy density allows for the creation of a variety of products that can be modified to match consumer needs while breaking the paradigm of fast foods, which usually are rich in added fat and sugar. The quickly-expanding range of lupin bean products includes ready-to-eat cereals, dairy-free beverages and gluten-free lupin flour and dips. With the emphasis today on sustainability, this highly renewable protein resource is just beginning to be tapped.